Circle City is an unincorporated community in Maricopa County, Arizona, United States. 14 miles northwest of Surprise, Arizona, on U.S. Route 60. As of 2000, it had a population of 1402, with 753 households. The development was built in the late 1950s by The Workmen's Circle, a Jewish fraternal and mutual aid society with roots in the Socialist movement of the early 20th century, as a retirement community for its aging members. Streets in the community are named for figures important to the Circle's membership, including Yiddish writer I.L. Peretz; Baruch Charney Vladeck, a labor leader and manager of The Jewish Daily Forward; New York Socialist politicians August Claessens, Morris Hillquit, and Meyer London; Samuel Gompers, head of the American Federation of Labor; and, four-time Socialist Party presidential candidate Eugene V. Debs. 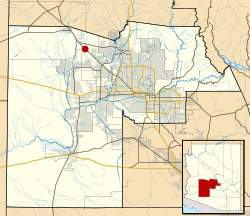 Circle City, Arizona Facts for Kids. Kiddle Encyclopedia.